So I'm guessing that a few of you will be heading off to university for the first time this year and I can't believe that it was a year ago that I was in the same position as you are now. While I was no pro at Freshers, I thought I would give you a few pieces of advice I wish I'd had for the first week or so at university. I feel if I hadn't have got to know my flat, I would have very much regretted it. Taking the time to speak to your housemates, if you're living in, is essential. 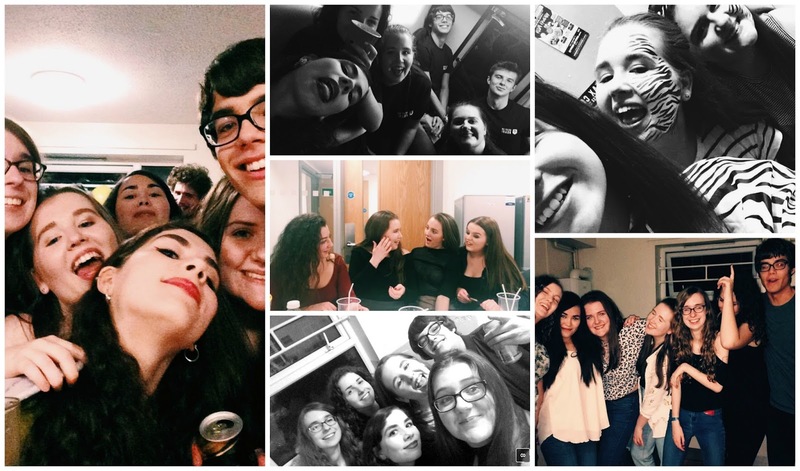 I tried to go to as many nights out as I could during Freshers and I was so glad I did because it was a chance to really get to know everyone. This is probably to most over used piece of advice but it's still one to bear in mind; everyone will be nervous to meet new people so awkwardness is normal but know that's to be expected when strangers are put together and you have no clue who they are. It's worth remembering that getting to know people will happen naturally so don't put pressure on yourself to get your life story out as soon as you meet them. Freshers fair was such a great chance to see, apart from your course, what the uni really has to offer from sports to societies- most universities offer an incredible array of activities for you to get involved at. I signed up for so many society and group newsletters at my freshers fair and, while I've still never attended most of them, I was glad I at least gave myself the opportunity to and I wasn't missing out. While I'll be going into second year I think I'll still be going along to this years freshers fair and see if there's anything new and interesting! So a little anecdote: I was given some biscuits and a biscuit tin by a family friend to take with me to uni and I have never been so happy it was there. Putting it in the kitchen made it that little bit more homely and communal as we bonded over biscuits a lot during the first week. With only the freshers events really happening, we spent most of our days sat in the kitchen talking and eating biscuits. Some people bake, some people leave their doors opening; anything to be seen as welcoming will give you the chance to really talk to and get to know your flat. Maybe later on in the year when you've made some friends on your course you'll be happy sitting in the same seats every lecture but, as no one in my flat did my course, I decided that each lecture during the first few weeks I would sit in a different seat and if someone sat next to me, flash them a smile and, most of the time, it followed with a fab conversation about the night out before or what college they were in (my uni is collegiate a bit like harry potter houses). It was only a week or two into my course that I sat next to someone who happened to be in my tutorial and we really got on. I definitely think switching up where I sit and taking some time to talk to new people really helped. A SOLID PAIR OF TRAINERS: Day and night, you're walking about a lot. Ditch the heels for nights out if that's what you used to; you won't last a week in them. Once you've done a night out in trainers, you won't want to go back. BLISTER PLASTERS: So you've decided to ditch the heels but that still doesn't mean your feet won't be ruined from night after night. These were a life saver for me. FANCY DRESS OUTFITS: We were told what events would be happening during our freshers but it wouldn't hurt to have a lil' stock of some costumes you could throw together even if it is a cheap superhero mask. A CARD GAME: While eating through the biscuits we played a lot of card games. A pack of playing cards was perfect to get us through the week but cards against humanity is another student fave. FACE WIPES: Appealing to the more beauty/ skin conscious amongst you, please don't make the same mistake I did and not have some of these until the last term of uni last year and instead had to do a full cleansing routine after every night out to get my make up off. Save time and just get some face wipes. They also double up as great desk and window ledge cleaners before you move out. SPRITE: So if my sister past on any better piece of advice from her time at uni it was the wonders of sprite and what it does on a hangover. If found this worked for me but, if you're a drinker, your favourite remedy would suffice; make sure you pack your hangover cure to the gallon (better be safe than sorry). MICROWAVEABLE FOOD: I'd say, especially for the first night, no one wanted to crack open their new pans just yet so opting for a student staple of super noodles or microwaveable rice or meals is the best option. Failing that, a takeaway with the flat might be a good shout. COLD & FLU TABLETS: My lectures at uni are recorded and so listening back to the first terms lectures were tough to understand due to the amount of coughing going on from us all. Freshers flu is definitely a thing so some of these would definitely be worth it. Also keep up your vitamins; orange juice is a must. So there's a few bits of advice and some of my uni "essentials". What is some advice you'd give Freshers if you've been to uni?